Nicole made a sourdough, apple & bacon stuffing that was also out of this world! I was surprised at exactly how much I loved the flavor that the sourdough added to the stuffing. I shouldn’t have been surprised considering how much I love sourdough and bacon, but I’m kind of dense. 😉 Perhaps we should start a new tradition of having two different stuffings at every holiday meal! Even if there are only two people in attendance. Preheat a saute pan over medium-high to high heat. Add 1 tsp canola oil to the pan. Once the oil is hot add the sausage, removed from the casings, into the pan. Use a spoon or spatula to break up the sausage. Brown the sausage for 6-8 minutes, stirring occasionally to allow all areas to brown evenly. Remove browned sausage from pan using a slotted spoon. Transfer to a paper towel lined dish to drain some of the oil. Pour off all but 1 tbsp of the rendered fat from the pan. Reduce the heat to medium and place the saute pan back on the burner. Add the onion, celery, pepper and leek to the pan. Saute for 10-15 minutes, stirring occasionally, until the onions are translucent and soft. Add the garlic to the pan and saute for another 1-2 minutes. While the veggies are sauteing, place the crumbled cornbread and browned sausage into a large mixing bowl. Once the veggies have finished sauteing, add them to the mixing bowl with the cornbread. Add all remaining ingredients except butter to the bowl. Stir to combine. If the stuffing appears on the dry-side, stir in more chicken broth in 1/4 cup increments. Place stuffing into a greased 13x9x2-inch glass or ceramic baking dish. Sprinkle diced, cold butter over the top of the stuffing. Place stuffing in preheated 375 degree oven. Bake at 375 for about 40-50 minutes, or until the top is golden and the stuffing is cooked through. Remove from oven and serve hot! Enjoy! *You may vary the temperature at which the stuffing is cooked, as is often necessary with holiday meals. For 350 degrees, cook the stuffing for about 1 hour. For 400 or 425 degrees cook for about 30 minutes. Oil a 3-quart baking dish (glass, enamel-coated, or cast iron will work)with 1 tbsp room-temperature butter and place into preheated oven. Preheat pan for about 7 minutes until pan is hot. Butter may brown. While the pan is heating, add the first 6 ingredients to a large mixing bowl. Whisk to combine evenly. In a separate mixing bowl, add the buttermilk, whole milk and eggs. Whisk to combine thoroughly. Remove hot baking dish from oven. Pour batter directly into hot baking dish. Place into preheated 450 degree oven. Bake at 450 for about 20-25 minutes, or until a toothpick inserted into the middle of the bread comes out clean. (A few specks of cornbread are alright but no batter!) Allow corn bread to cool for 10 minutes before serving. 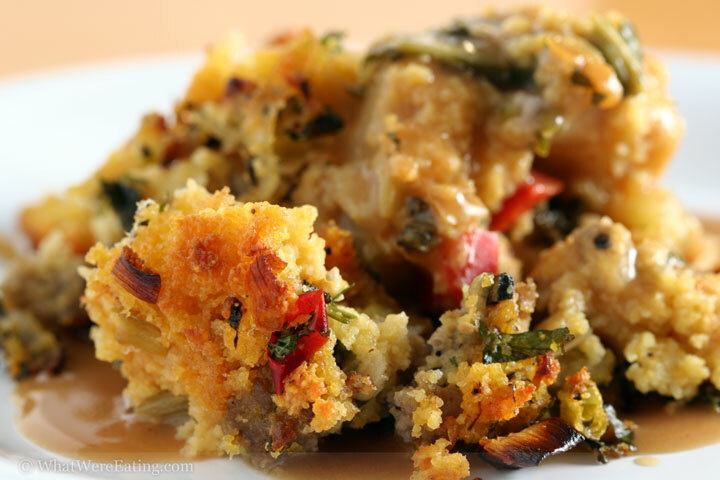 If saving for use in cornbread stuffing, allow bread to cool completely before covering. Enjoy! I’m a New England at heart, so it’ll always be stuffing. Though I’m happy to taste them all. Hey, got a random question for ya… do you know where I can buy truffle oil? Mama’s jonesin’ for some truffle… well, anything is delicious with truffle oil. thought you might know. i know how you feel ashley! mmm mmm i love me some truffles! you can find truffle oil at whole foods, i think trader joes (although I would call them on that), there’s a place called harvest ranch market in encinitas that i know carries it… hmmm, the little grocery store in the village of rancho santa fe carries actual truffles i think so they probably have truffle oil too!… and i know i’ve been in a cheese shop recently that had both real truffles and truffle oil, i can’t remember the name of it though! actually there’s a chance that the cheese shop was in la! can’t remember though. i hope that helps! you rock big time. thanks! mama’s makin’ some out of control pizza tonight found my truffle oil… and trip on this: at the new Albertson’s in East Village(?) I was quite surprised. I haven’t tried it yet, but it was pretty inexpensive, so I guess we’ll see… wish me luck, my pizza dough always comes out a little foreign prompting a sarcastic eyebrow raise from the ol’ ball n’ chain but it’s de-lish! Just wanted to report that I broke from our family tradition (we never have cornbread dressing) and made this, and oh my was it OUTSTANDING. A huge hit with the parents and with me, and I have two containers of it frozen right now because the recipe was so huge. Cannot WAIT to bust those out in future days. Or, you know, tomorrow. I will definitely be making this again. Really good stuff(ing). :o) Ingredients are pretty typical of most really tasty cornbread/bread/sourdough dressings. Not sure why many consider cornbread dressing to be southern. It’s fairly common in upstate New York where I’m from and we have relatives from “down south” that have never made dressing from cornbread. Mostly just a matter of family tradition I believe. You don’t have to wait for Thanksgiving to try this! My first visit here-just surfing for cornbread and sausage dressing to back up my own idea-and found yours–looks great! In our family, usually, if it was to be stuffed in a bird or other meat, it was” stuffing”. Served on the side like a casserole, it was” dressing”. Believe me,coming from an Italian-American background, living in the deep South of Louisiana(home of the TurDuckKen and the deep-fried turkey) and marrying into a Cajun family I have made and experienced many recipes of both,and yes, sometimes there was a crossover! I love looking at the recipes from others, and sometimes use them to change mine. I really enjoyed your website! One question-did I miss the approximate number of servings for the basic cornbread and for the Cornbread and Sausage Dressing/Stuffing? I’m preparing for very hungry Cajuns this time! Just stopping by to grab the recipe once more — this is definitely going to show up at this year’s Thanksgiving table again. I’m salivating already! Hi Matt – I would guess about 12 side servings. i hope that helps! so I went on a mission to find a great recipe for it…and POW!!! this is a GREAT blog!! my new favorite!! This is fantastic. It has a lighter consistancy and taste than the traditional sage-onion varieties. It was a hit at Thanksgiving. if one wanted to use a pkg cornbread mix.. cooked in a 2 qrt dish….would that be enough cornbread for your chorizo cornbread stuffing? thinking 2 would be too much. 1 1/2?